In the Beginning…This fertile land was first homesteaded in 1910. Over the years, it was successfully developed into a working ranch and operated full scale for nearly 100 years. 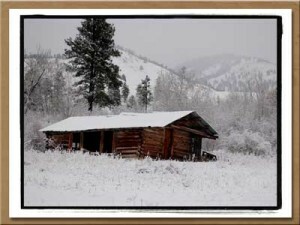 Original cabin still stands on the property, circa 1914. 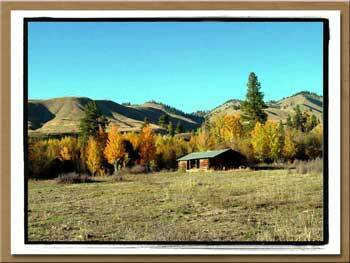 Our Vision… Nestled in a secluded valley just north of Salmon, Idaho, Elk Mountain Ranch offers one of Central Idaho’s most unique real estate opportunities with a limited number of private ranch parcels. Respect for Nature… Elk Mountain Ranch was designed to preserve the pristine nature of the land and protect existing wildlife habitat. Site Plan… Building envelopes have been created within each ranch ensuring privacy, fabulous views and access for all owners. Septic has been approved on all properties. Roads and utilities are already in place. The Surroundings… A mix of independent ranches, open range and national forest provide Elk Mountain Ranch residents with ready access to some of the most rugged country and best big game habitat in the country. Today… Modern conveniences including high speed internet, electricity, and well maintained roads offers comfortable living in Idaho’s beautiful mountains. Why Relocate to Idaho… Whether you are a work-at-home or traveling professional searching for peace and serenity away from a hectic work schedule; a retiree who needs to ensure there is health care nearby; or family choosing a safe place to raise children, the Salmon, Idaho area offers all the amenities. Visit our Salmon, Idaho page to see a sampling of what Salmon, Idaho has to offer its residents. Buy this Upper Rolling Rock Ranch property for sale in which the original homestead sits to own your own piece of history.